A staple of Russia and the Slavic world, borscht has inspired films and novels – and has even reached outer space. Borscht is quintessentially Russian. A single bowl of that ruby-red beetroot soup, served with a ladleful of smetana (sour cream) and a hunk of black bread, conjures up images of Red Square and St Basil’s Cathedral almost as much as a glass of vodka or a spoonful of caviar. Except that borscht is not Russian at all. Nor was it originally made with beetroot. Exactly when and where borscht appeared is something of a mystery; but it was probably first made in what is now Ukraine, somewhere between the fifth and ninth centuries AD. Back then, it was a simple broth cooked from cow-parsnips, a plant commonly found in hedgerows and fields; and it was from the Proto-Slavic word for cow-parsnips that it took its name. According to medieval herbals, cow-parsnips were usually collected in May, before the shoots became too tough and stringy. The flowers, stems and leaves were then chopped up, placed in a clay pot with plenty of water and left to ferment until a sour-tasting liquid had formed. This was reputed to be a splendid cure for hangovers; but it was usually cooked with chicken (or sometimes beef) broth, egg yolks and cream or millet meal to make a tart – and tasty – soup. This early borscht was eaten mostly by the rural poor. Even as late as the 15th century – by which point it had spread into modern Poland and Belarus – it was looked down upon as a ‘peasant’ food. It was rarely, if ever, eaten by nobles. As the food historian Maria Dembińska noted: it ‘never appeared on the royal table during the reign of the Jagellonian kings, nor was it consumed by the royal servants’. But over time, borscht changed. Not only did it spread further afield, but the social background of its consumers also widened. Especially in the Polish-Lithuanian Commonwealth, where economic decline prompted radical socio-cultural shifts in the course of the 17th century, nobles gradually became more willing to try the humble fare they had previously shunned. As a result, a range of new ingredients was added, reflecting the crops cultivated in different regions and the tastes of the local nobility. So greatly did this affect the flavour of borscht that, by the late 17th century, the word had come to describe a wide variety of sour soups, most of which bore little resemblance to the medieval original. Increasingly, cow-parsnips were replaced with new sources of sourness. The Polish-Lithuanian Commonwealth led the way. Published in 1682, Stanisław Czerniecki’s Compendium ferculorum contained several recipes for borscht. Some used ‘kissel’ (a fermented mixture of water and oatmeal, barley flour, or rye flour) to make ‘white borscht’; while others called for lemon to be used to produce altogether more exotic concoctions. In some parts of modern Poland, cowslip was substituted with sorrel (to make ‘green borscht’); while in other regions, ‘kvass’ – a fermented drink made from rye bread – was used instead. Perhaps the most telling alternative was, however, cabbage, sometimes in the form of sauerkraut. Giving the soup a slightly sweeter taste, cabbage was especially popular in the region between the rivers Donets and Volga. Beetroot only made it into borscht a little later. Certain types of beets – such as chard – had, of course, been cultivated since at least the fourth century BC and – as the account books of Novogrod testify – their leaves had been used to make variations of ‘green borscht’ since their introduction to Northern Europe in the later Middle Ages. But their hard, fibrous roots were far too bitter to be used – even in borscht. 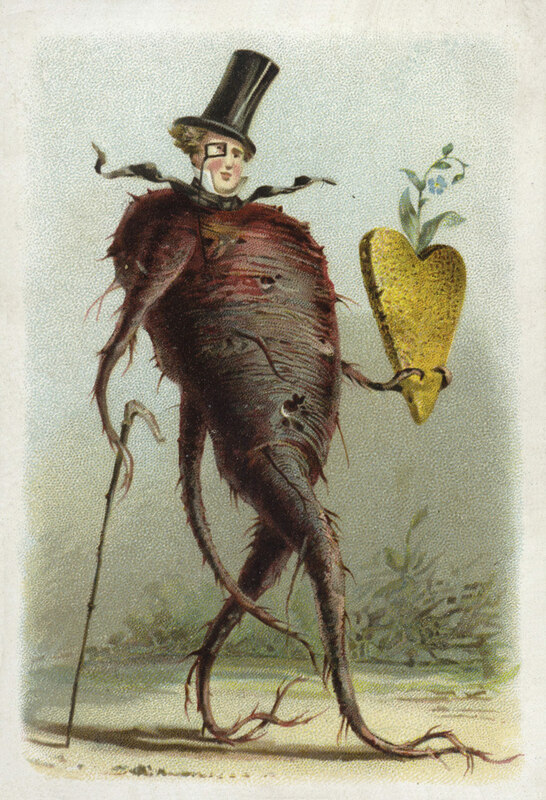 Only in the mid-16th century did beetroot, with its tender, red roots, reach the Slavic world. Even then, it was something of a rarity. The few who could cultivate it were tentative about experimenting. The first step was taken by the Polish humanist and polymath, Mikołaj Rej (1505-69). In Żywot Człowieka Poczciwego (‘The Life of an Honest Man’, 1568), Rej included an early recipe for pickling beetroot. But though Rej spoke highly of the tangy brine left over from the process, neither he nor his contemporaries did much with it. When and where this rudimentary beet sour was first used to make borscht cannot be known. There are plenty of legends. Some say that the earliest versions of ‘red borscht’ were made by hungry Don Cossacks during Peter the Great’s unsuccessful siege of Azov in 1695. Others claim that it was a group of starving Zaphorozhian Cossacks from the Dneiper Rapids who came up with the idea during the siege of Vienna in 1683. But there is probably little truth in either. Most likely, beetroot borscht was made by ethnic Ukrainians living under Russian rule east of the Dneiper in the late 17th or early 18th century. Their method was relatively simple. Once the beet sour had been prepared, it was diluted with water, then put into a clay pot and brought to the boil. When it was bubbling away, sliced beetroot, cabbage and carrots were thrown in – along with any other vegetables that were to hand. Bone broth was then added, perhaps with a small amount of pork, beef, or chicken. A cold version was also developed. To a base of cold beet sour was added a host of raw vegetables, such as dill, spring onions, parsley and garlic. In some regions, such as Lithuania, ‘kefir’ (a fermented milk product) or sour cream was also included, along with boiled eggs. Yet the advent of beetroot was not the end of borscht’s evolution. In the 19th century, potatoes and tomatoes were added, too. Although these had been introduced to Western Europe from the Americas several centuries earlier, it was only then that they became common in the East. While potatoes quickly became a staple of red borscht, however, the use of tomatoes varied. Sometimes, they were used as well as beet sour; but by the turn of the century, their increasing availability allowed them to be used instead of beetroot. Partly because of its simple ingredients, borscht was adopted by Christians as a food for fasts. In many regions, the colour of the borscht, as well as its ingredients, reflected the liturgical season. In Poland, red borscht – made with fish stock, or sometimes only vegetables – was usually eaten for dinner on Christmas Eve. White borscht, by contrast, was usually eaten in Lent – again without meat. 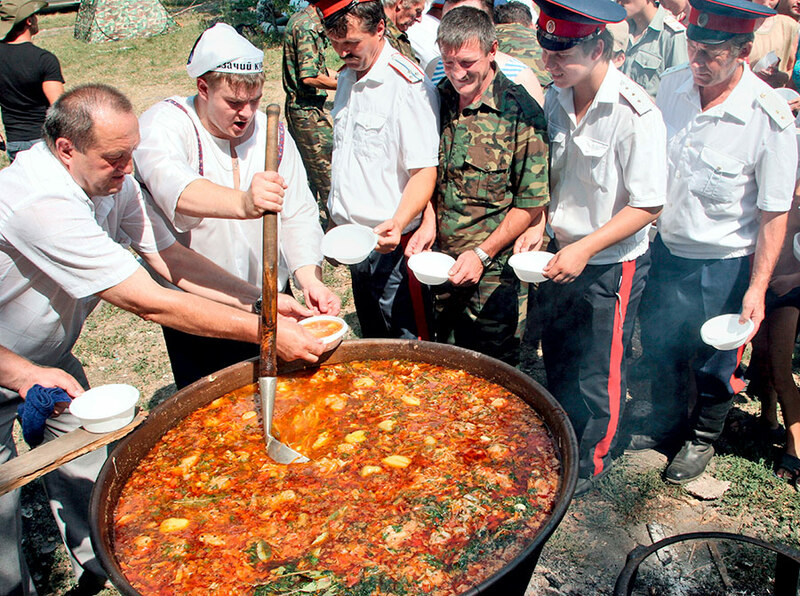 In Ukraine, borscht of most varieties also became a familiar dish at funeral feasts. Borscht was also a favourite of the many Jews who lived in rural shtetls in Poland, Ukraine and Russia. Particularly among Ashkenazi Jews, red borscht – cooked without meat – became a familiar dish during Passover; while cold vegetarian borscht, served with a generous helping of sour cream, was eaten as a daytime meal during Shavuot. Thus ingrained in local culture, borscht began to spread its wings. Towards the end of the 19th century, imperial expansion and the construction of new transport links took the dish not only to the far corners of the Russian Empire, but also as far afield as Persia. Soon enough, it was travelling westwards, too. In the first instance, its occidental drift was facilitated by French chefs like Marie-Antoine Carême (1784-1833), who learnt how to cook it while working for Tsar Alexander I and adapted the recipe to French tastes when he returned home. But it was immigration that catapulted borscht into the US. Although emigrants had been leaving Eastern Europe for the West as early as the 18th century – taking green borscht with them – it was Ashkenazi Jews fleeing persecution who were responsible for introducing the red variety. Until well into the 20th century, they carefully preserved their cultural and culinary identity – so much so that the Catskill Mountains, where many Jewish families took their holidays, became known as the ‘Borscht Belt’. As borscht was putting down roots in the US, it enjoyed something of a renaissance in Soviet Russia. Recommended to the Communist leadership by its nutritious simplicity, it became one of the hallmarks of the Soviet kitchen. So closely was it identified with the Soviet ideal that, in Sergei Eisenstein’s Battleship Potemkin (1925), it is a dispute over the meat used to make borscht that catalyses the mutiny; while in Mikhail Bulgakov’s novel, Master and Margherita (1928-40), the greedy chairman of the House Committee at 302B Sadovaya Street is settling down to a steaming plate of borscht when he is arrested for dealing in black-market currency. So too, the Soviet premier Leonid Brezhnev is reputed to have adored it so much that his wife made it for him every day – even after they came to live in the Kremlin. Cosmonauts even took freeze-dried borscht into space. It is still a favourite across the Slavic world. In Ukraine, for example, the restaurant chain Puzata Hata sells more than a tonne of borscht every day. Indeed, it is so important a part of culinary life that Ukrainian media occasionally uses the ‘borscht index’ – that is to say, the price of the ingredients needed to make four litres of red borscht – to estimate the purchasing power of foreign currencies relative to the hryvnia. No doubt borscht will continue to evolve in the future. But as long as it is made it will remain an emblem of hearty meals, good fellowship and shared culture – both between Slavic nations and across the world. What better reason could there be to enjoy a bowl of borscht?